Why Should Every Aussie Invest on Back to Wall Freestanding Bath? As you look into the trends of bathroom renovation projects that are being done in Australian homes, it has become quite evident that freestanding baths have secured a place in almost everywhere. Whether you want a modern remodelling or want to create dramatic fusion in the interior design of your bathroom, freestanding baths are just the perfect addition. However, not every freestanding bath have the same appeal or function. So, you need to understand the difference between the baths minutely. For the best collection of back to wall freestanding bath in Perth, you need to rely on us, Direct Tile & Bath. Being the trusted supplier of this type of contemporary baths, we want to share a few valid reasons to strengthen your decision of purchasing this bath even more. Here we go! Give it a read. It often becomes quite challenging for the designers to renovate a small bathroom with freestanding baths. However, with back to wall baths, things fall in line quite easily. It is set up against a wall. You can use the wall to add exciting features. For instance, design the entire shower rack on that wall and give it some interesting lighting setup too. So, it is indeed a space saving solution. 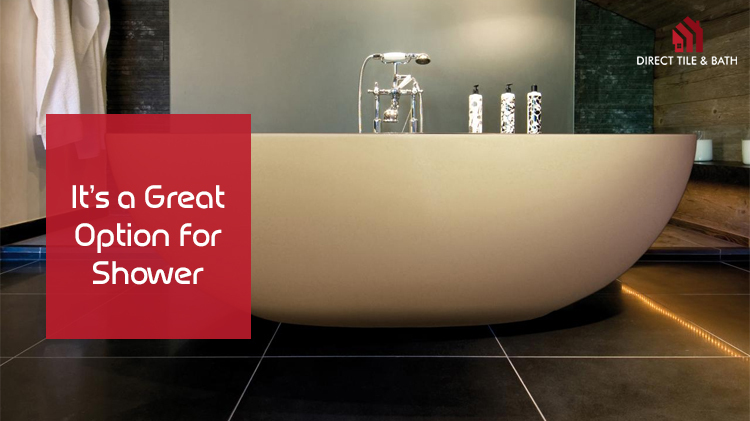 Well, you may have dreamt of having a contemporary and luxurious bathroom of your own. But, to be frank, naughty children at home and a classy clawfoot bath in your bathroom - these two things don't really co-exist. However, with back to wall baths, you will not have to take any stress about the physical condition of your bath much. Instead, no matter how much your kids run around your bathroom or hop inside the bath for water splash, it won’t break down. It's beautiful! You can say, it is sophistication to another level. You will have a pool of versatile options; once you visit our store as we are one of the best tile shops in Perth, you will find it impressive. You may feel like spoilt with so many options, suitable for all sorts of bathroom design and that too in a reasonable price bracket. All of those are aesthetically pleasing to the eyes. Get a white one and place it against a black feature wall to get a dramatic look. Well, if you want to have the access of shower and bath at the same time, nothing can be a better option than the back to wall baths. Get your shower installed any side of the bath and save yourself from the extra work in managing the water spillage. Let us give you some recommendations on your purchase, especially regarding the design. If you want a sharp and aligned look for your bathroom, going for the square design will be the best option you have. It gives a neat and modern look to your bathroom. Back to wall baths are indeed the other name of sophistication, and you should certainly have it to enjoy its amazing benefits.